Geographic app store estimates spanning multiple companies and platforms suggest that Apple's App Store, buoyed by growth beyond just games, is the top individual seller by company in China, but not by platform. 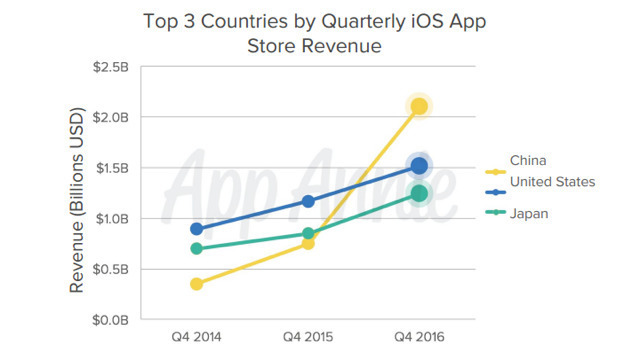 In a report by App Annie, China is suspected to have exceeded the U.S. to become the largest market for the iOS App Store, pulling down between $5 billion and $6 billion in revenue. Should Apple not grow its share, and merely maintain, given existing smartphone market expansion trends, this puts Apple on a track to garner $16 billion in purchases by 2020. Other markets pursued by Apple aren't expected to grow quite as quickly as China has, however. As cited by both App Annie and Schachter, India's app store will climb to only $2.1 billion in total, across all companies and platforms. Any gain in the China market will help to expand Apple's Services business, and fulfill CEO Tim Cook's prognostication that it alone will be the size of a Fortune 100 company before the end of 2017. In a previous analysis, Schachter said that the App Store model is "one of the best business models ever created." In part because of App Store growth, Apple quarterly reports show the Services arm has consistently offered positive growth compared to the same quarter in the previous year, ranging from between 9.1 percent and 26.2 percent over the last two years, ever since it became its own revenue category in the financial results. The App Store generated $3 billion in purchases in December 2016 alone, making it the store's best month to date. In the same time period, AppleCare and storage services also set new revenue records.